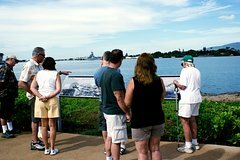 Special Pearl Harbor Visitor Center Tour created for Viator customers. Includes the USS Arizona Memorial Narrated Tour and admission to the Pearl Harbor Virtual Reality Center. Small group tour with the maximum of 8 travelers. Special Pearl Harbor Visitor Center Tour created for Viator customers; includes the USS Arizona Memorial Narrated Tour and admission to the Pearl Harbor Virtual Reality Center. National Park Service’s USS Arizona Memorial Narrated Tour is recommended to all visitors looking for a more enhanced experience on their tour of the Memorial and the Pearl Harbor Visitor Center. Step back in time and let History come alive at the National Parks Service’s new Pearl Harbor Virtual Reality Center. Three incredible and historically accurate Pearl Harbor tours that are best shared with our new virtual reality technology. Travel back in time with never-seen-before 360 degree perspectives and retrace the events of December 7, 1941.